And Baby was not in a corner. Baby was center stage all dressed in white and light wood, looking fairly medieval with her springs and leather and wooden handles. I’lll admit I was a little intimidated. She definitely saw me. I looked sideways, demurring. ”Have a seat!” said Andrea. “I must admit I’ve been a little obsessed with the Arm Chair lately and sometimes I like to start with the chair,” she said. So we started our session, albeit a little unorthodoxically for a classical Pilates session, starting on the chair and not on the mat or reformer. We began with, not an old lady exercise, but Boxing! I’ve got to hand it to Joseph Pilates, that was a great name to give the first exercise on the Old Lady Chair! Did you know that there used to be men’s exercises and women’s exercises in JP’s studio? I imagined him giving Boxing to the ladies to make them feel strong! (I’m sticking with that). So what could go wrong on a chair with smallish, light springs? On a body like mine, with hypermobility syndrome, lots. Andrea saw daylight at the back of the chair, my left knee kept wandering, and the handles (not me) didn’t cooperate and wouldn’t stay level. Curse you Baby Chair! I was determined and I finally got the hang of it and kept my back on the chair, kept my knee from wandering, and the handles decided to stay even. For this body in front of Andrea, it was Arm Circles, Hug, and the Rowing Series. This was all super cool because I could actually feel my back! I didn’t have to use my biceps and arms so much because the springs are light. The best part? I got a massage! I’m not sure it was supposed to be a massage, but that’s what it felt like. The Arm Chair is the perfect place for the teacher to get behind you for an assist. And what an assist it was! Andrea has strong hands and helped me keep my shoulders down just the right amount. I want to give that to my students! The last exercise I did was Breathing. As with every Pilates exercise, Breathing is a full body exercise. Here’s how to do it: Starting position: Seated with back against the chair, soles of the feet together. Start in the open Hug position while inhaling, then while exhaling lift your arms up and roll forward making your spine into a curve, and touch the ground if possible. HOLD ON! THE BACK OF THE CHAIR JUST MOVED! (breathe and proceed). Inhale and roll back up against the chair with your arms out in front of you, then open your arms to the starting position. “Keep moving” said Andrea. “Can you move a little faster?” she asked. I could say I wanted to savor this movement, but the truth is, sometimes I’m slow. I like the classical method because we keep moving and the body learns in motion. 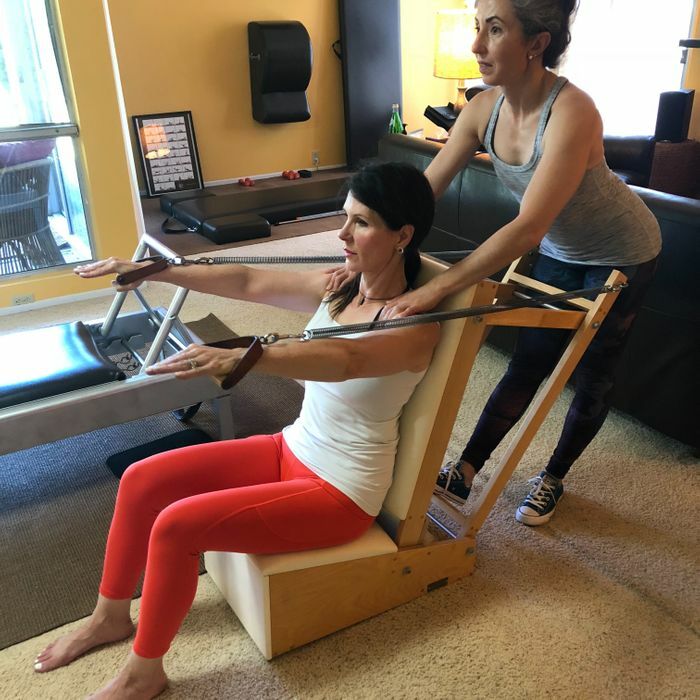 Think “flow” Joseph Pilates gives us metaphors for life. And the Arm Chair did inform the rest of my workout! When I got to the Reformer and did the 100, I imagined my back against the Arm Chair. The best part was that I found a connection in my Back Rowing that I had never found before. That part where the two-way stretch should move the straps back before you dive forward? This girl! I also “found the Chair” in Short Spine Massage. My arms were straight and my chest was open. And my self-proclaimed “beached whale” Breaststroke actually got up and out of the water! Thank you Baby Chair! Can I get a hallelujah? I’m singing the praises of the Arm Chair from the highest mountain! I am Julie Andrews in Sound of Music channeling Romana! I am Romana! I don’t have an Arm Chair all dressed in white. I wonder if I can rig a sitting box to my Cadillac and use my light arm springs.